Web Mining Extraction of high-level information from the Web for applications such as personalized recommendation and sentiment analysis. Ensemble Algorithms Algorithms that smartly combine multiple learning models in order to achieve superior performance. Parallel Computing High performance computing platforms based on GPU and Cloud Computing techniques. Evolutionary Computation Powerful global optimization techniques that have found great successes in a wide range of scientific and industrial applications. Vertical Search Engine Acquires timely, accurate and valuable information sparsely distributed in the Web and presents the data in a highly structured format. Mobile Advertising Platform Seamlessly integrates advertisers, publishers and the public, displaying the right (contents & formats) advertisements to the right mobile users. Customer Relationship Management CRM can help increase the profitability of your business by establishing a strong, active and long-term relationship with customers. Palmprint Recognition The recognition of a person by his/her palmprint image. Early Diagnosis of Alzheimer's Disease An early and accurate diagnosis of AD can offer the best chance to treat the symptoms and plan for the future. Guo, Z.H., Li, Q., You, J., Zhang, D. and Liu, W.H. (2012) "Local Directional Derivative Pattern for Rotation Invariant Texture Classification". Neural Computing & Applications, vol. 21, pp. 1893-1904. Xu, X.P., Guo, Z.H., Song, C.J. and Li, Y.F. (2012) "Multispectral Palmprint Recognition Using a Quaternion Matrix". Sensors, vol. 12, pp. 4633-4647. Guo, Z.H., Zhang, D., Zhang, L. and Liu, W.H. (2012) "Feature Band Selection for Online Multispectral Palmprint Recognition". IEEE Transactions on Information Forensics and Security, vol. 7, pp. 1094-1099. Yuan, B. and Liu, W.H. (2012) "Measure Oriented Training: A Targeted Approach to Imbalanced Classification Problems". Frontiers of Computer Science, vol. 6(5), Springer, pp. 489-497. Shang, S., Yuan, B., Deng, K., Xie, K.X., Zheng, K. and Zhou, X.F. (2012) "PNN Query Processing on Compressed Trajectories". GeoInformatica, vol. 16(3), Springer, pp. 467-496. Tu, Q., Lu, J.F., Yuan, B., Tang, J.B. and Yang, J.Y. (2012) "Density-Based Hierarchical Clustering for Streaming Data". Pattern Recognition Letters, vol. 33(5), Elsevier, pp. 641-645. Yuan, B. and Ma, X.L. (2012) "Sampling + Reweighting: Boosting the Performance of AdaBoost on Imbalanced Datasets". In Proceedings of the 2012 International Joint Conference on Neural Networks, IEEE, pp. 2680-2685, Brisbane, Australia. Huang, Z., Yuan, B. and Hu, X.L. (2012) "Understanding the Top Grass Roots in Sina-Weibo". In Proceedings of the 2012 International Workshop on Intelligence Science and Intelligent Data Engineering, LNCS 7751, Springer, pp. 17-24, Nanjing, P.R. China. Huang, Z. and Yuan, B. (2012) "Mining Google Scholar Citations: An Exploratory Study". In Proceedings of the 2012 International Conference on Intelligent Computing, LNCS 7389, Springer, pp. 182-189, Huangshan, P.R. China. Liu, H.Q., Yuan, B. and Li, C. (2012) "Music Recommendation Based on Label Correlation". In Proceedings of the Joint Conference of the Sixth Chinese Semantic Web Symposium and the First Chinese Web Science Conference, Springer Proceedings in Complexity, Springer, pp. 143-152, Shenzhen, P.R. China. Ma, X.L. and Yuan, B. (2012) "Enhancing Software Search with Semantic Information from Wikipedia". In Proceedings of the Joint Conference of the Sixth Chinese Semantic Web Symposium and the First Chinese Web Science Conference, Springer Proceedings in Complexity, Springer, pp. 1-9, Shenzhen, P.R. China. Hu, X.L., Wang, L.T. and Yuan, B. (2012) "Querying Representative Points from a Pool Based on Synthesized Queries". In Proceedings of the 2012 International Joint Conference on Neural Networks, IEEE, pp. 1734-1739, Brisbane, Australia. Shang, S., Ding, R.G., Yuan, B., Xie, K.X., Zheng, K. and Kalnis, P. (2012) "User Oriented Trajectory Search for Trip Recommendation". In Proceedings of the 15th International Conference on Extending Database Technology, ACM, pp. 156-167, Berlin, Germany. Ma, T.L., Yang, Y.J., Wang, L.W. and Yuan, B. (2012) "Recommending People to Follow Using Asymmetric Factor Models with Social Graphs". In Proceedings of the 17th Online World Conference on Soft Computing in Industrial Applications, AISC 223, Springer. Cao, Y.B., Yang, Y.J. and Liu, W.H. (2012) "E-FallD: A Fall Detection System Using Android-Based Smartphone". In Proceedings of the 9th International Conference on Fuzzy Systems and Knowledge Discovery, IEEE, pp. 1509-1513. Min, Z., Yang, Y.J. and Liu, W.H. (2012) "An Approach of Text Sentiment Analysis for Public Opinion Monitoring System". In Proceedings of the Joint Conference of the Sixth Chinese Semantic Web Symposium and the First Chinese Web Science Conference, Springer Proceedings in Complexity, Springer, pp. 131-141, Shenzhen, P.R. China. Xun, G.X., Yang, Y.J., Wang, L.W. and Liu, W.H. (2012) "Latent Community Discovery with Network Regularization for Core Actors Clustering". In Proceedings of the 24th International Conference on Computational Linguistics, pp. 1351-1360, Mumbai, India. Li, S.F., Fan, Y.S. and Li, X. (2012) "Service Selection Method Supporting Service Relation". Computer Integrated Manufacturing Systems, vol. 18 (3), pp. 645-653. Zhang, D., Guo, Z.H., Lu, G.M., Zhang, L., Liu, Y.H. and Zuo, W.M. (2011) "Online Joint Palmprint and Palmvein Verification". Expert System with Applications, vol. 38 (3), pp. 2621-2631. Guo, Z.H., Zhang, D., Zhang, L., Zuo, W.M. and Lu, G.M. (2011) "Empirical Study of Light Source Selection for Palmprint Recognition". Pattern Recognition Letters, vol. 32 (2), pp. 120-126. Guo, Z.H., Li, Q., Zhang, L., You, J., Liu, W.H. and Wang, J.H. (2011) "Texture Image Classification Using Complex Texton". In Proceedings of the 7th International Conference on Intelligent Computing, LNAI 6839, pp. 98-104, Zhengzhou, P.R. China. Guo, Z.H., Wu, G., Chen, Q.W. and Liu, W.H. (2011) "Palmprint Recognition by a Two-Phase Test Sample Sparse Representation". In Proceedings of the 2011 International Conference on Hand-based Biometrics, IEEE, Hong Kong. Li Hao, L., Guo, Z.H., Ma S.Y. and Luo N. (2011) "A New Touchless Palmprint Location Method Based on Contour Centroid". In Proceedings of the 2011 International Conference on Hand-based Biometrics, IEEE, Hong Kong. Luo, N., Guo, Z.H., Wu, G. and Song, C.J. (2011) "Joint Palmprint and Palmvein Verification by Dual Competitive Coding". In Proceedings of the 3rd International Conference on Advanced Computer Control, IEEE, pp. 538-542, Harbin, P.R. China. Luo, N., Guo, Z.H., Wu, G., Song, C.J. and Zhou, L.L. (2011) "Local-Global-Based Palmprint Verification". In Proceedings of the 3rd International Conference on Advanced Computer Control, IEEE, pp. 543-547, Harbin, P.R. China. Yang, Y.J., Zheng, S.Q. and Liu, W.H. (2011) "Constructing the Optimal Multiple String-Kernel Combination for Web Classification". Journal of Computational Information Systems. Han, S.L., Yang, Y.J. and Liu, W.H. (2011) "Incremental Learning for Dynamic Collaborative Filtering". Journal of Software, vol. 6 (6), pp. 969-976. Sun, L., Yang, Y.J. and Liu, W.H. (2011) "Trended DTW Based on Piecewise Linear Approximation for Time Series Mining". In Proceedings of the 2011 IEEE International Conference on Data Mining－ Workshop Papers, IEEE, pp. 877-884, Vancouver, Canada. Huang, S., Yang, Y.J. and Liu, W.H. (2011) "An Enhanced Fall Detection Approach Based on Cost Sensitivity Analysis". In Proceedings of the 1st ACIS International Symposium on Software and Network Engineering, Springer, pp. 81-85, Seoul, Korea. Li, X., Huang, R.S., Jin, M., Ma, J.G., Yang, Y.J., Wu, X.Y. and Liao, L.F. (2011) "SNS Application Using Call Detail Records". In Proceedings of the 2nd International Conference on Electrical and Control Engineering, IEEE, pp. 4972-4975, Yichang, P.R. China. Yuan, B. and Liu, W.H. (2011) “A Measure Oriented Training Scheme for Imbalanced Classification Problems”. 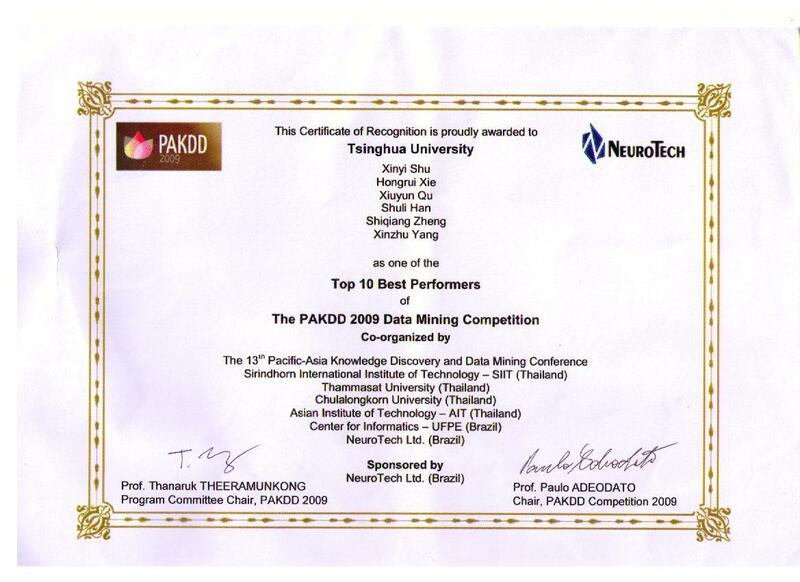 In Proceedings of the 15th Pacific-Asia Conference on Knowledge Discovery and Data Mining － Workshop Papers, LNCS, Springer, pp. 293-303, Shenzhen, P.R. China. Shang, S., Yuan, B., Deng, K., Xie, K.X. and Zhou, X.F. (2011) "Finding the Most Accessible Locations �C Reverse Path Nearest Neighbor Query in Road Networks". In Proceedings of the 19th ACM SIGSPATIAL International Conference on Advances in Geographic Information Systems, ACM, pp. 181-190, Chicago, Illinois. Yang, Y.J., Shu, X.Y. and Liu, W.H. (2010) "A Probability Click Tracking Model Analysis of Web Search Results". In Proceedings of the 17th International Conference on Neural Information Processing, Springer, pp. 322-329, Sydney, Australia. Xie, H.R., Yang, Y.J. and Liu, W.H. (2010) "WeightLOFCC: A Heuristic Weight-Setting Strategy of LOF Applied to Outlier Detection in Time Series Data". In Proceedings of the International Conference on Advanced Data Mining and Applications, Springer, pp. 529-536, Chongqing, P.R. China. Han, S.L., Yang, Y.J. and Liu, W.H. (2010) "PPNMF: Improving Weighted Nonnegative Matrix Factorization with Prior Information". In Proceedings of the Annual International Conference on Advanced Topics in Artificial Intelligence, Puket, Thailand. Xu, G.Y., Zheng, W.M., Wu, H.P. and Yang, Y.J. (2010) "Combining Topic Models and String Kernel for Deep Web Categorization". In Proceedings of the 7th International Conference on Fuzzy Systems and Knowledge Discovery, IEEE, pp. 2791-2795, Yantai, P.R. China. 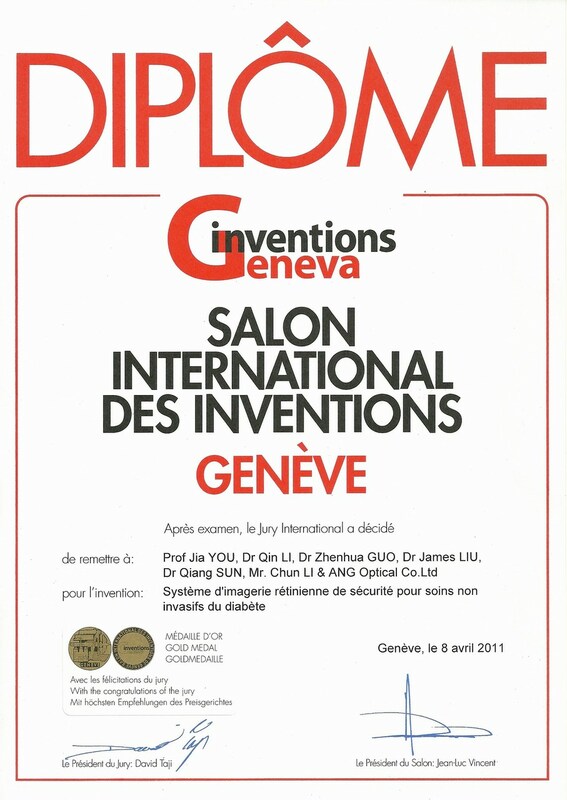 Kang, F.W., Liu, X.D. and Liu, W.H. (2010) "A Personalized Ranking Approach via Incorporating Users’ Click Link Information into PageRank Algorithm". In Proceedings of the 2010 International Conference on Information Security and Artificial Intelligence, Chengdu, P.R. China. Yuan, B., Li, C. and Chen, W. (2010) "Training a Pac-Man Player with Minimum Domain Knowledge and Basic Rationality". In Proceedings of the 2010 International Conference on Intelligent Computing, CCIS 93, Springer, pp. 169-177, Changsha, P.R. China. Lin, F.Q., Chen, B.C., Yuan, B. et al. (2010) "Composition and Implementation of RFID Lightweight Middleware". Computer Engineering, vol. 36(17), pp. 77-80. Guo, Z.H., Zhang, L. and Zhang, D. (2010) "A Completed Modeling of Local Binary Pattern Operator for Texture Classification", IEEE Transactions on Image Processing, vol. 19, pp. 1657-1663. Guo, Z.H., Zhang, L. and Zhang, D. (2010) "Feature Band Selection for Multispectral Palmprint Recognition". In Proceedings of the 20th International Conference on Pattern Recognition, IEEE, pp. 1136-1139, Istanbul, Turkey. Guo, Z.H. and Lu, G.M. (2010) "Palmprint Recognition Using Gabor Magnitude Code". In Proceedings of the 2010 International Conference on Machine Learning and Cybernetics, IEEE, pp. 796-801, Qingdao, P.R. China. Xu, X.P. and Guo, Z.H. (2010) "Multispectral Palmprint Recognition Using Quaternion Principal Component Analysis". In Proceedings of the 2010 International Workshop on Emerging Techniques and Challenges for Hand-based Biometrics, IEEE, pp. 1-5, Istanbul, Turkey. Guo, Z.H., Zhang, L., Zhang, D. and Mou, X.Q. (2010) "Hierarchical Multiscale LBP for Face and Palmprint Recognition". In Proceedings of the 17th International Conference on Image Processing, IEEE, pp. 4521 - 4524, Hong Kong, P.R. China. Guo, Z.H., Zhang, L., Zhang, D. and Zhang, S. (2010) "Rotation Invariant Texture Classification Using Adaptive LBP with Directional Statistical Features". In Proceedings of the 17th International Conference on Image Processing, IEEE, pp. 285 - 288, Hong Kong, P.R. China. Wang, X.Y. and Chen, Y.B. (2010) "A Novel Seal Imprint Verification Method Based on Analysis of Difference Images and Symbolic Representation". In Proceedings of the Fourth International Workshop on Computational Forensics, LNCS 6540, Springer, pp. 56-67, Tokyo, Japan. Chen, B.C., Li, Y.J., Liu, W.H. and Yan, X.W. (2010), "Solution and Its Analysis of a Kind of Markov Chain Model Used in CRM Problem". Computer Engineering and Applications, vol. 46(4), pp. 49-51. Qin, K., Yang,Y.J., Zheng, S.Q. and Liu, W.H. (2010) "A Unified Record Linkage Strategy for Web Service Data". In Proceedings of the 3rd International Conference on Knowledge Discovery and Data Mining, IEEE, pp. 253-256, Phuket, Thailand. Qin, K., Yang, Y.J., Liu, W.H. and Liu, X.D. (2009) "An Integrated Approach for Detecting Approximate Duplicate Records". In Proceedings of the 2009 Asia-Pacific Conference on Computational Intelligence and Industrial Applications, IEEE, pp. 381-384, Wuhan, P.R. China. Zheng, S.Q., Yang, Y.J., Wu, H.P. and Liu, W.H. (2009) "Chinese Text Classification Using Key Characters String Kernel". In Proceedings of the 2009 International Conference on Semantics, Knowledge and Grid, IEEE, pp. 113-119,Zhuhai, P.R. China. Xie, H.R., Han, S.L., Shu, X.Y., Yang, X.Z., Qu, X.Y. and Zheng, S.Q. (2009) "Solving Credit Scoring Problem with Ensemble Learning: A Case Study". In Proceedings of the 2nd International Symposium on Knowledge Acquisition and Modeling, IEEE, vol. 1, pp. 51-54, Wuhan, P.R. China. Qu, X.Y., Yuan, B. and Liu, W.H. (2009) "A Novel Two-Phase Method for the Classification of Incomplete Data". In Proceedings of the 2009 International Conference on Information Management, Innovation Management and Industrial Engineering, IEEE, vol. 3, pp. 452-455, Xi'an, P.R. China. Qu, X.Y., Yuan, B. and Liu, W.H. (2009) "A Predictive Model for Identifying Possible MCI to AD Conversions in the ADNI Database". In Proceedings of the 2nd International Symposium on Knowledge Acquisition and Modeling, IEEE, vol. 3, pp. 102-105, Wuhan, P.R. China. Han, S.L., Yuan, B. and Liu, W.H. (2009) "Rare Class Mining: Progress and Prospect". In Proceedings of the 2009 Chinese Conference on Pattern Recognition, IEEE, pp. 137-141, Nanjing, P.R. China. Yang, X.Z., Yuan, B. and Liu, W.H. (2009) "Dynamic Weighting Ensembles for Incremental Learning". In Proceedings of the 2009 Chinese Conference on Pattern Recognition, IEEE, pp. 98-102, Nanjing, P.R. China. Yang, X.Z., Yuan, B. and Liu, W.H. (2009) "An Empirical Study of the Convergence of RegionBoost". In Proceedings of the 2009 International Conference on Intelligent Computing, LNAI 5755, ©Springer, pp. 527-535, Ulsan, South Korea. Yang, X.Z., Yuan, B. and Liu, W.H. (2009) "The Effect of Distance Metrics on Boosting with Dynamic Weighting Schemes". In Proceedings of the 6th International Conference on Fuzzy Systems and Knowledge Discovery, IEEE, vol. 1, pp. 320-324, Tianjin, P.R. China. Yuan, B. and Gallagher, M. (2009) "Convergence Analysis of UMDAC with Finite Populations: A Case Study on Flat Landscapes". In Proceedings of the 2009 Genetic and Evolutionary Computation Conference, ACM, pp. 477-482, Montreal, Canada. Yuan, B. and Gallagher, M. (2009) "An Improved Small-Sample Statistical Test for Comparing the Success Rates of Evolutionary Algorithms". In Proceedings of the 2009 Genetic and Evolutionary Computation Conference, ACM, pp. 1879-1880, Montreal, Canada. Wang, X.Y. and Chen, Y.B. (2009) "Seal Image Registration Based on Shape and Layout Characteristics", In Proceedings of the 2nd International Congress on Image and Signal Processing, IEEE, pp. 3440-3444, Tianjin, P.R. China. Wang, H.Y. and Chen, Y.B. (2009) “Logo Detection in Document Images Based on Boundary Extension of Feature Rectangles”, In Proceedings of the 10th International Conference on Document Analysis and Recognition, pp. 1335-1339, Barcelona, Spain. Wang, J., Yuan, B. and Liu, W.H. (2008) "Application of Decision Trees in Mining High-Value Credit Card Customers". In Proceedings of the 11th Joint Conference on Information Sciences, Atlantis Press, Shenzhen, P.R. China. Zhang, T., Yuan, B. and Liu, W.H. (2008) "Predicting Credit Card Customer Loyalty Using Artificial Neural Networks". In Proceedings of the 11th Joint Conference on Information Sciences, Atlantis Press, Shenzhen, P.R. China. Liu, B.H., Yuan, B. and Liu, W.H. (2008) "Classification and Dimension Reduction in Bank Credit Scoring System". In Proceedings of the Fifth International Symposium on Neural Networks, LNCS 5263, ©Springer, pp. 531-538, Beijing, P.R. China. Yuan, B., Orlowska, M. and Sadiq, S. (2008) "Extending a Class of Continuous Estimation of Distribution Algorithms to Dynamic Problems". Optimization Letters, vol. 2(3), ©Springer, pp. 433-443.